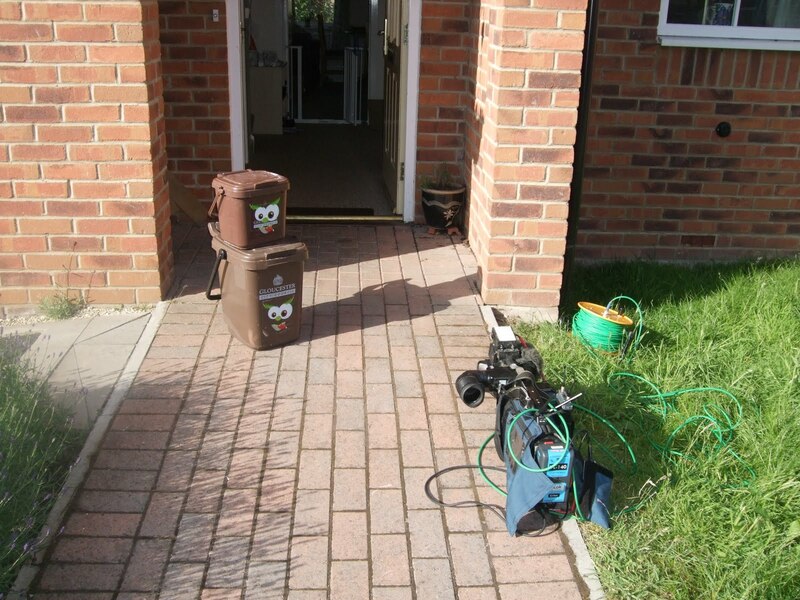 Well it all started on Wednesday with a phonecall from the wonderful Mrs Green saying that the BBC wanted to do an interview with someone who had food waste bins and would I like to do it as she didn't have the bins as they don't live in an area where they are used! Me being me said "yes no problem" and then I soon had a phonecall from the BBC telling me what time they would be here the next morning! The first Interview was going to be at 6.20 AM!!!!!! The lady on the other end fo the phone said they would probably turn up at about 5.30am. So a tidy up of the house then started, the alarm was sent and an earlier night was called for. After a very restless night (probably worried that I would be awake in time for the next morning) we were woken with the sound of an aerial going up! DH looked out of the window to see a big van out side the kitchen window! Now all this time I had thought I was being interviewed by the local radio not NATIONAL BBC TV! A quick run up the stairs to tell DH That I must have got the "wrong end of the stick" and actually I was going to be TV not Radio and the morning started. All in all I was interviewed three times 6.20am, 7.20am and 8.20am plus they did live links outside our front door to introduce what was going to happen later in the program! 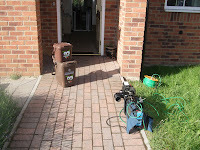 Tv presenter Phil Lovell with cameraman outside or front door! It was very interesting to be on the other side of the camera for once and of course the children were very excited to have the BBC in the house. The boys even made a very short film. The boys of course became the topic of conversation at school that day with lots of people saying "I saw your mum on tv"! Unfortuantely BBC breakfast appears to one of the program that the BBC don't put up on Iplayer so as we did manage to record it on to the hard drive of the DVD player when I have put it onto dvd I will try and upload it here so that those of you you wish to watch it can! Well it has now been about 6 weeks of a Fibromyalgia flare and I am getting somewhat fed up of it! So yesterday I decided I was going to have a creative day! So I got out my sewing machine and started! Trying to ignore the fact that I was in pain! Fi rst I finished of my new Knitting needle roll. I use wonderfully soft Brittany needles which do not fit in my needle roll which I bought so I decided to make my own! After that decided to sew up a lavender sachet that had been cut out since last year I used an old embroidered tray cloth that I picked up in a chairty shop and then I filled it with the lavender that I had harvested from outside my front door last year! The last project of the day was whilst DH was out at college, Monday is college night. So I went up into the loft and found the box of zips I inherited from my grandmother and set about making a square bag! I had a Fat Quarter of Fabric from a trip to the patchwork shop the other day and I turned it into a this bag. I think when I make another I shall interface it to make a little more rigid! Right off to get ready for the day although it is prettty dreary outside I might even head to town and do some more charity shopping for fabric! Half way throught the year! Well here we are in the sixth month of the year. The month of DS2's birthday when he will be 10 it is slightly scary to think that it was 10 years ago that he was born. Well back to writing about what i have been doing. I have been inspired by fabricy things and have got my sewing machine out from the depths of the understairs cupboard. I seem to have gone very shabby chic at the moment with checks and patterns but being typical me doing it at a much cheaper price!